Seventy years ago, Kansas City Southern Railway's legendary "Southern Belle" began a tradition of "Streamlined Hospitality" on rail lines from Kansas City to New Orleans. Pulling a train that included passenger sleeping, lounge,m and diner cars, it provided uncompromising comfort. The powerful 3000-horsepower F-3 diesel-electric engine was equipped with the latest in mechanical improvements for fast, efficient, streamliner service. 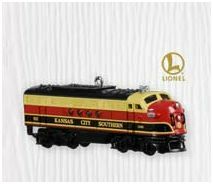 This repainted version of the 13th ornament in the Lionel Trains series is a LIMITED QUANTITY EDITION offered in very LIMITED quantities during the October 2010 Ornament Debut. Notes: This ornament is priced at Secondary Market Collectible values. I was very pleased to add the repaint of #13, in the Kansas City Southern colors to my collection. It was USPS delivered in Mint condition, in just a few days. It's a great addition to any collection, or by itself to anyone that likes Trains.